I became aware of The Gathering 2013 back in 2011. It was a corner-of-the-eye thing, spotted online and then forgotten. 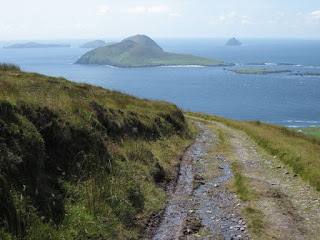 I was in Ireland writing The House on an Irish Hillside, a book that's part memoir, part exploration of my own sense of identity as a member of the Irish diaspora, and partly an examination of the Dingle Peninsula's Celtic inheritance. Which, I suppose, is why something called The Gathering caught my eye. The ancient Celts disapproved of writing. They believed it weakened their ability to remember; and in their worldview shared memory was the vital component that bound people together in a web of individual awareness of communal identity. In Ireland they reinforced and passed on their sense of community at seasonal tribal gatherings deliberately sited on mountaintops which gave them the widest possible view of the landscape with which they identified. It was a formidably successful culture, characterized by its own diaspora which was apparently fuelled by expanding tribal populations, a warrior ethos, and a culture of maintaining close links with its homelands. Celts seem to have started out east of the Rhine and expanded across huge areas, including much of Britain, Ireland, Belgium, France, the Netherlands, Portugal, Spain, Germany, Switzerland, Austria and Italy. They spread along the Danube towards the Black Sea, pressed on to Thrace and Macedonia and made contact with the Scythians. At the height of their expansion they crossed into Asia Minor, founded settlements in Galatia, in eastern Phrygia, and occupied the site of modern Ankara. What's remarkable is that they did this without financial systems, written records, or administrative centres. Instead, their cultural identity was expressed across vast territories by shared language, belief systems, customs, skills and art. The Gathering 2013 is a government initiative reaching out to Ireland's worldwide diaspora. It's designed to boost the tourist trade and encourage emotional and financial investment in the home country. Glamourised by identification with the concept of ancient Celtic gatherings, it's a feelgood project in a time of world recession, intended to showcase Ireland's willingness to embrace not only those with Irish roots but those who identify with Irishness. And as 2013 approaches I'm fascinated by the emotions it's arousing in Ireland. What delights me about those ancient Celtic gatherings is that they seem to have made no distinction between their spiritual, social and economic elements. They involved sacred shamanist rituals to promote, balance and support the powerful flow of energy which, in their belief system, linked and animated each element in the universe. But they were also huge, cheerful parties at which goods were bartered, marriages arranged, and animals bought and sold, amidst feasting, music and dancing. It was a system designed to reinforce shared identity by identifying and passing on shared values. And it took place in settings intended to reflect an ideal state of balanced interdependence. Part of the challenge for The Gathering 2013 is that it's a response to economic crisis. Recession's hit hard in Ireland and anti-government feeling's rife since the latest budget proposals have been unveiled. There's general resentment and trepidation, and cuts to child benefit and carers' allowances in particular are seen as indications that our politicians have little respect for women. Added to that, in the wake of a young woman called Savita Halappanavar's tragic death in a Galway hospital, many Irish people currently feel ashamed rather than proud of their inherited values. Savita, an Indian immigrant to Ireland, was pregnant but it became clear that the pregnancy wasn’t medically viable. Her own medical condition was deteriorating so, recognising that they’d already lost their baby, she and her husband asked for a termination. But an unresolved discrepancy between Ireland’s legislation and its constitution led to the conclusion that termination would be illegal while a foetal heartbeat remained detectable. Ultimately Savita and her baby both died. The case is still under investigation but when the story broke thousands of Irish people took to the streets with banners. Abortion’s a political hot potato in Ireland where part of our cultural inheritance is a legacy of state subservience to the Roman Catholic Church. Many people, including some with moral objections to abortion, believe Savita's death occurred as a result of political unwillingness to confront that legacy. Others, including myself, feel shamed by our unawareness of the legislative position and its implications and, to that extent, believe we own a share in the responsibility for what happened. So the feelgood initiative's become a focus for protest. But, in my opinion, that’s not a bad thing. A few weeks ago I was asked if I’d take part in a Gathering 2013 events launch in Dingle town on New Year’s Eve. I was glad to. Here on the Dingle peninsula, an area that's suffered successive, crippling waves of emigration since the nineteenth century, The Gathering offers a practical boost to the tourist trade on which hundreds of families depend for employment. The same applies all across Ireland, where individuals and locals have come together with energy, creativity and wit to embrace the initiative as an expression of self-help and solidarity in recession. That in itself seems a valid reason to support it. But to my mind there are other reasons as well. For me they're rooted in the template provided by those ancient gatherings that seem actively to have made no distinction between the spiritual, social and economic elements of the society they expressed. Recently, responding to public pressure, the Irish government’s announced its intention to introduce new legislation on abortion. I can’t think of any subject so much in need of a broad, balanced context for debate. Or any country in which the sacred needs so badly to be reconciled with the profane. On that basis I can’t imagine a better forum for debate on Irish values than The Gathering 2013. It seems to me that its greatest strength lies in the fact that the government’s reached out to the worldwide diaspora, contextualizing national issues and encouraging input across vast territories from people with a shared sense of identity but strongly contrasting ideas about what that might actually mean. I think that if we grab it by the scruff of the neck and use it, The Gathering can be more than just a huge, year-long party to boost the economy. It can be a creative focus for something profound. We visited each other around Nollaig na Mban time last year/year before. I've been meaning to come back and must make a point of it. Your thoughts echo my thoughts on just about everything you write. Soul sister? For sure! I will stay in touch with you. I would love to know more about what Dingle is planning for The Gathering. A guest spot is always open at Ireland with Kids for you! Hi Jody, that's very kind! I'd love to guest for you again sometime. I have a preview copy of the beautifully-produced 'Dingle Peninsula Events & Gathering Calendar 2013' and it's packed with events throughout the year. Just flipping through it I've spotted Nollaig na mBan in January, the Dingle Walking Festival in February, Celebrations for St. Patrick's Day in March, Fungi the Dolphin's 30th anniversary in Dingle Harbour in April, The Blasket & West Kerry Welcome Home Week in May, The Mighty Session in June, Ventry Regatta & International Horse-shoe Throwing Competition in July, The Dingle Races in August, The Kennedy Clan Reunion in September, The Maritime Heritage Weekend & Dingle Boatyard Workers Reunion in October, The Other Voices music festival in November and The Wren's Day in December. (Well, you did ask!) And those are just picked at random out of several others happening each month. I think it's going to be a wonderful, creative year. what a wonderful blog and your book looks fascinating! it is the great information....thank you for postng the blog..
You're welcome Ramji :) Thanks for your comment.